Looking for a quick Saturday night dinner. Jan wanted za’atar pizza, but Eilene and I wanted a bit more protein. Beef on the side to add as you will. 1. Mix most of the olive oil with most of the za’atar and set it aside. 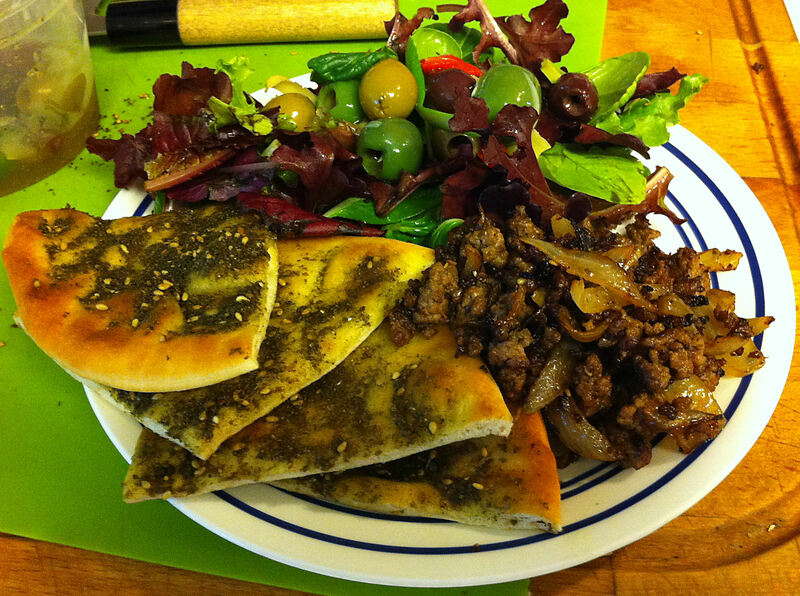 Tip: Reserve one tablespoon of oil for sautéing and one teaspoon of za’atar for the beef and onions. Note: How much oil you use depends on your diet, use less for a low fat version. You only need enough oil to turn the za’atar into a paste that you can spread across the flat bread. 2. Slice the onion, pole to pole in ¼ inch sliced. 3. Put one tablespoon of oil in a skillet and sauté the onions with the salt until soft, about 4-5 minutes. 4. Fry the hamburger with the onions. Tip: Break the meat up into small pieces and mixing well with the onions. 5. Add the remaining za’atar and pepper. 6. Continue frying the beef and onions until the beef is well browned. 7. Spread the za’atar oil mix across the top of the flat bread. Note: I use the soft pita breads that I buy from Hummus Heaven at the farmer’s market. 8. Put the breads in the oven on the middle rack and broil on high, until well browned on top. Tip: Setting the breads on a pizza stone, directly on the oven grill, or a wire rack on a baking sheet, will make the bottoms crisper. 9. Serve the pizza whole to be torn up or cut them into wedges. Serve the beef and onions on the side to top the pizzas as the diners choose. Tip: Serve with a side salad of mesclun and mixed olives.